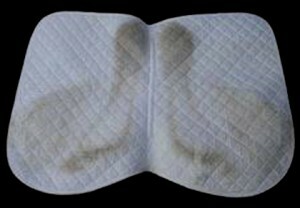 What is Your Dirty Saddle Pad Telling You? See below for an informative article by Jochen Schleese, Certified Master Saddler and Certified Saddle Ergonomist, which explores saddle pad dust patterns and saddle fit. Based on this photo, the dust pattern on the saddle pad indicates that the saddle fits well. The dirt should accumulate in the areas of the saddle pad that experience the most movement: at the front of the saddle (where the shoulder moves up and back) and at the back (where horse’s back swings). No dirt should show in the areas where the saddle doesn’t come in contact with the horse’s back, such as the gullet or at the transition between sweat flap and panel. The white triangle under the front part of the saddle indicates a good position and fit, because in this area the saddle should sit the most quietly without movement. This is where most of the rider’s weight sits (like the collar on a white dress shirt which becomes dirty because there is constant movement and air and dust accumulating, whereas the inside of the shirt on top of the shoulder remains clean). In nature, the horse carries most of his weight on the forehand, and the load on the forehand increases even more with a rider on top. In order to shift weight from the forehand to the hindquarters, the horse must be able to lift up through his back. Only then can he pivot his pelvis and step farther underneath his body with his hind legs, which in turn elevates his front end and allows greater freedom of movement to the shoulders. Therefore, most of the movement should show on the saddle pad at the front (shoulder) and back of the saddle, not under the triangle. The white triangle on this saddle pad indicates that effort has been made to free up the front and the back of the saddle so the horse can bring up his back and engage the hindquarters. The preference is to get horse and rider as close to each other as possible using the saddle as the interface to allow maximum communication and effectiveness of the rider’s aids without impeding the horse’s performance or causing any damage to the horse’s body. The saddle pad (for an English saddle) should be used only for what it was intended to do – to protect the leather of the saddle from the horse’s sweat. In some parts of Europe people don’t even use saddle pads. The comfort for the animal is in the properly fitted saddle panel, not in the pad. Main Article Photo courtesy of Schleese Saddlery – Based on this photo, the dust pattern on the saddle pad indicates that the saddle fits well.